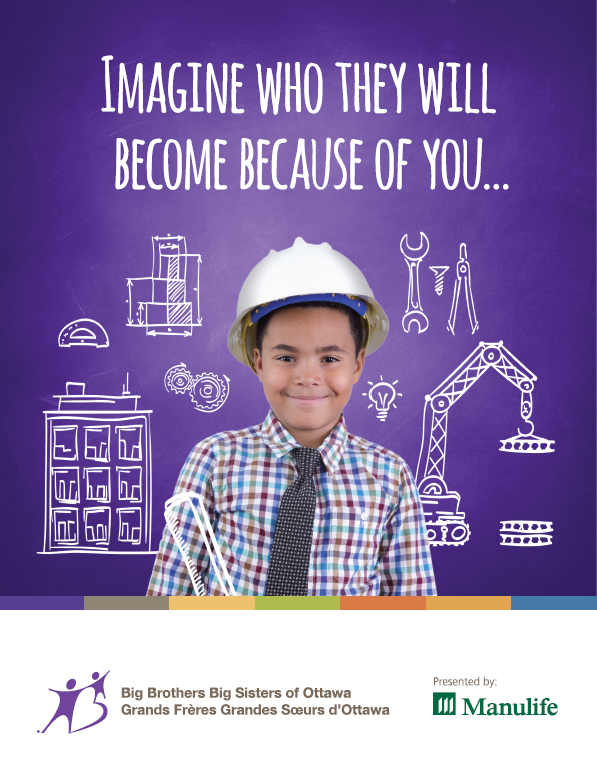 As Canada’s leading child and youth mentoring charity, Big Brothers Big Sisters (BBBS) facilitates life-changing relationships that inspire and empower children and youth to reach their full potential. As Canada’s leading child and youth mentoring charity, Big Brothers Big Sisters (BBBS) facilitates life-changing relationships that inspire and empower children and youth to reach their full potential. BBBS has been mentoring youth for over 100 years and was named one of the top children’s charities by the Financial Post in 2016. Big Brothers Big Sisters of Ottawa (BBBSO), a local agency of BBBS, has been serving the Ottawa community for 46 years. We began creating Big Brother friendships in 1970 and Big Sister friendships in 1973. Our programs have grown from the traditional 1:1 matches to include a variety of different programs that serve youth in both the community and schools; including Mentoring In School, Meet You In School, Go Girls, Game On and Conversation Club. BBBSO proudly serves over 1100 youth on an annual basis. Changing the course of young lives changes the future of communities. By every measure, BBBS returns positive results in the mental health, employment and civic engagement of the mentees. A 2013 study by Boston Consulting Group found that for every $1 invested in mentoring by BBBS, there is an $18 to $23 social return on investment to the community. The study also determined that of those mentored through BBBS programs: 63% completed post-secondary education, 47% hold senior leadership positions and 50% are more likely to volunteer themselves. Donate. Many giving options are available, including monthly, annual, one-time, planned giving, gifts of stocks and securities, corporate and foundation giving. Make an in-kind donation. A wish list can be found at bbbso.ca/donate/in-kind. BBBSO also accepts donations of gently used clothing, and more. Visit donatetobbbso.ca to learn more. Get involved with an event. You can participate, attend, volunteer or sponsor one of our events held throughout the year. Fundraise for BBBSO. Choose BBBSO as the recipient of your corporate golf tournament, quarterly breakfast or other event, or host a clothing drive on our behalf. BBBSO relies on the support of community volunteers to ensure that our programs are successful. We have many opportunities for individuals or groups to become involved in our organization. We offer a variety of mentoring programs ranging in commitment from 1 to 4 hours a week. We also offer opportunities to support our fundraising events and to participate on our Board of Directors and on various Committees. Cisco, a long-time supporter of BBBSO, had seven teams of employees participate in the 2017 Bowl for Kids’ Sake fundraiser, in addition to being a corporate sponsor for the event. Corporate partners, like Cisco, are critical to helping BBBSO foster, facilitate and support life-changing mentoring relationships for children and youth in Ottawa. Through generous funding from the Ontario Trillium Foundation, and in partnership with Surgenor Ottawa, BBBSO purchased a truck and is able to offer door-to-door clothing pick-ups and collect clothing from bins across the city in a more efficient way, ultimately leading to greater revenues in support of children and youth in Ottawa.